Jackkerouac is a Legacy Library. Legacy libraries are the personal libraries of famous readers, entered by LibraryThing members from the Legacy Libraries group. 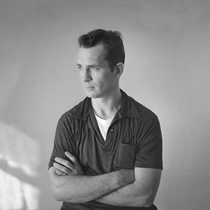 » Jack Kerouac's legacy profile. Jackkerouac is also an author. » See Jack Kerouac's author page. About meJack Kerouac was an American novelist and poet best known for his most famous novel On the Road, written mainly in 1951 but not published until 1957, which became a literary sensation although at first no publisher was ready to publish it due to Kerouac’s experimental writing regarding homosexuality, drug use and minorities. Jean Louis Kerouac was born in Lowell, Massachusetts on March 12, 1922. He died at the age of 47 in 1969 due to internal bleeding caused by long term alcohol abuse. Kerouac studied at Columbia University where he met William S. Burroughs and Allen Ginsberg who became his lifelong friends. Together they formed the Beat movement which led Kerouac to become an iconic literary figure of the 20th century. Kerouac’s spontaneous prose was highly admired, but he constantly strived to improve it. He wrote Visions of Cody in 1952, another memoir of his friend Neal Cassady, and The Subterraneans (1953) using experimental writing techniques. His childhood years inspired his Lowell novels; Doctor Sax (1948-52), Maggie Cassidy (1953), and Visions of Gerard (1956). Kerouac also produced poetry collections including Mexico City Blues (1955) and Book of Blues (1954-61), experimenting with idioms of jazz and blues. After turning to Buddhism (1953-1956), Kerouac wrote Some of the Dharma (1954), and The Dharma Bums (1957). Later works include Desolation Angels (1956-61), Big Sur(1961), and Vanity of Duluoz (1968). His instruction brochures, Essentials of Spontaneous Prose (1953) and Belief and Technique for Modern Prose (1953) are still important to writers looking for some excellent advice. Kerouac's books were kept at his mother's different residences, then at his sister's house in North Carolina, and later at his homes in Orlando and St Petersburg, Florida. His working library was formed in the 1930s and 40s, later many books were acquired in 1949, during the period of Kerouac's extensive travels and the writing of his first book. In his later years Kerouac was sent many books from publishers and aspiring authors, they have been catalogued here regardless of whether there is proof that he read them or not. About my libraryUnfortunately there is no single catalogue of Kerouac's books, so a number of sources have been used. This legacy library has been catalogued by Ben Stables (LT member benshelf1), and LT member pitoucat. Photographs taken at his home in Northport, Long Island, in 1964 show Kerouac posing next to his bookcase. Many of the titles on the books can be read, and have been catalogued here. Books still owned by Kerouac's estate were offered for sale in 1991. At the time two sale catalogues were produced: Water Row Books, Catalogue 55: Featuring Jack Kerouac's Library (1991), and Water Row Books "List JK-1". Both catalogues contain much of the same items, although the second catalogue has some additions. Both lists are copyrighted by Jeffrey H. Weinberg of Water Row Books, and are used with his permission. The 'Kerouac Quarterly Vol 2 No 1' (1998) pp.66-68 features a list of 84 books Kerouac owned extracted from the Water Row Lists by Paul Maher Jr. (Thanks to LT member aulsmith for sorting through this list). These books were at that time on a bookcase in the dining room at the home of John Sampas, executor of the Kerouac Estate, at his home, 22 Sanders Ave., Lowell. These catalogues include two other books not part of Kerouac's library; a copy of "The Subterraneans" given by Kerouac to his wife Stella, and Allen Ginsberg's "The Moments Return" signed by Ginsberg to Stella Kerouac. Many of Kerouac's books have been listed for sale online, or otherwise their presence has been published online - these sources have all been listed individually in the comments section of each book. Included are 13 maps owned by Kerouac, one dating from the time of his journeys featured in 'On the Road', there are 19 such maps held by the Berg Collection (New York Public Library) but not all of the maps had sufficient detail to be catalogued here.